First and foremost question, how true is this statement? Very true. Apologizing after causing death is of no use. 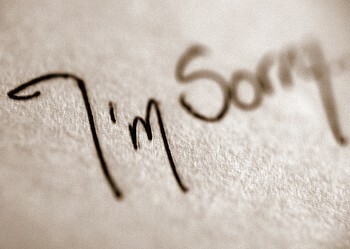 Saying sorry for accidental mistakes is acceptable, as long as you don't repeat them. Once you know your faults, try to correct them. The word has no meaning when it is not used along with correcting action. "Your life is a book; make it a best seller". Some people use sorry to justify themselves, some just have a habit of saying sorry while they don't mean it, very few are those who apologize and mean it, and would do everything to correct it. The person who is harmed by the other's actions will not buy a sorry easily, but he will surely accept it if realizes that the apology is genuine. Don't be persistent in making mistakes. It is useless if you say sorry to your parents after you fail an exam, and it is when you realize your mistakes are actually harming you, not them is when it will hit you that you study for your sake, not your parents'! If the thief realizes that he is making a mistake by stealing, it will save many houses from getting stolen. Think before taking action, act before its too late and correct actions that turn out to be wrong, and keep running this loop, both in your mind, and life!